To set the context for the report, the case for and nature of rail research in the UK is outlined. In addition, it is important to understand the structure of the UK rail and rail research industry. Rail guided transport networks involve complex interactions between engineering, human and commercial systems. This systems characteristic is fundamental to many of the benefits of rail transport, but also causes significant challenges. As a result, for the rail industry to meet its objectives effectively requires that all its elements from the industry structure to rail research priorities reflect the importance of the systems interactions. The benefit of only one degree of freedom is that a high capacity with a high degree of safety is achievable by application of a signalling system. The disadvantage of a single degree of freedom is it creates inflexibility (e.g. braking is the only option to avoid an obstruction). As a consequence, delivering the high capacity depends upon a high degree of reliability of both the system and it's individual components. Delivering the safety and reliability each depend upon the interaction of a large number of individual people, their relationships with each other, and with the engineering and commercial environment in which they operate. Thus, there are numerous engineering interfaces (mechanical, electrical, electro-magnetic, aerodynamic and acoustic) and system interfaces that have significant safety, reliability, capacity or environmental implications, more so than with many other transport modes. Successful development of rail guided transport systems, as a key constituent of the integrated transport chain, depends upon successful development and application of core knowledge related to each of these elements of individuality. This theme, which builds on the a report by Sir David Davies (1996), will re-emerge and be further developed in successive chapters of this document. Rail research is essential to delivery of effective rail transport and hence to the nation. There is growing evidence that research delivers economic benefit to its sponsors. These points are argued in the sections below. The DETR (2000) has stated that trends such as increasing pollution, increased road congestion, inadequate public transport, and potential social exclusion are detrimental to the social well being and national competitiveness of the UK. They have recognised in the Integrated Transport Policy that effective rail transport systems are essential to addressing these trends. This can be expected to remain the case until well beyond the ten years of the Integrated Transport Policy. Indeed until, for example, an alternative transport mode addresses these trends better than rail, or the factors driving these trends cease. Hence rail transport is essential to the social and national well-being of the UK for the foreseeable future. Given that rail has existed for over 200 years, why is more rail research necessary? Much of the UK rail industry has only existed in its present privatised form since 1994, a relatively short period, and London Underground is undergoing significant structural changes as part of the Public Private Partnership (PPP). The privatised rail companies have different priorities to the nationalised industry and operate in an entirely different framework which itself imposes different priorities. The Integrated Transport Policy represents a step change in governmental policy, and, for example, rail companies must balance pressures from shareholders with statutory and regulatory obligations. Rail companies, surface rail and London Underground alike, also face different challenges. They have moved from managing declining demand for their services to managing growth in demand and the need to provide additional capacity. Journey patterns are changing with increased demand for new and longer journeys, including multi-modal journeys, and increased off-peak travel on the underground. Together, these factors mean that there have been widespread and significant changes in rail industry priorities and challenges in recent years. For UK rail systems to be optimised in the face of these, it is inevitable that existing knowledge will need to be complemented by research. Combining the conclusions at the end of the above two paragraphs, leads to the further conclusion that rail research is essential to the provision of an effective rail system and thereby essential to the social and national well-being of the UK for the foreseeable future. Research and development is essential if commercial enterprises are to survive. Indeed, there is growing evidence (Cookson, 2000) that companies committed to research and development reap rewards in future sales growth and in stock market value. Four separate surveys covering over 623 organisations, the majority of them large, have found that those with high R&D intensities were much more likely to show faster sales growth over the medium to long term (four to ten years). With such a large sample of organisations, it can be assumed that this result applies to the rail industry. The effectiveness of rail research can be illustrated by current products that derive from the extensive programme of research conducted by British Rail Research from the 1970's onwards. Historically, these products include Solid State Interlocking (SSI), Integrated Electronic Control Centre (IECC), Radio Electronic Token Block, Vision, Vampire, the Structure Gauging Train and Stoneblowers. More recently they include new products whose antecedent is nevertheless the core rail research previously undertaken. Examples include Smart Sander, Control Centre of the Future and Panchex. These products provide many benefits to the industry, including improved reliability, reduced costs and improved safety. In the commercial area, a key success was the building up of a thorough understanding of the factors affecting demand for rail services as seen in the Passenger Demand Forecasting Handbook. This reflects the results of many studies conducted in house, by academic research teams and by consultants, which collectively gave the rail industry an understanding of its demand which is the envy of other sectors of the transport industry. Several of the above examples, notably SSI and IECC, also illustrate the importance of public funding of rail research. In these cases industry did not believe that some of the fundamental concepts would work and would not commit funds until the fundamental research had been undertaken by BRR. It is only as a result of rail research that these products were developed and the benefits realised. The examples demonstrate the benefits of past rail research. The question is where is the source of future equivalent developments? Research in the rail industry takes many different forms and is undertaken by many different organisations. It ranges from fundamental investigations into generic new and novel approaches, through applied development to refinements of existing approaches or technology,. This and the organisations that typically undertake each are illustrated in Figure 1. Fundamental rail research is normally conducted in universities. Refinement of existing approaches is generally undertaken by the end user organisation (for example Railtrack) or subcontracted out where there are resource limitations. 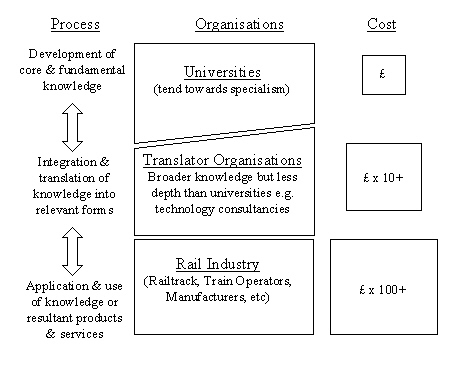 Near market rail research (the development and translation of fundamental research into useable concepts) and its integration into end user organisations is often undertaken by Translator Organisations (eg AEA Technology Rail, Halcrow-Transmark, Interfleet and Mott MacDonald), as well as some manufacturers and organisations with specific remits. Typical university priorities are the development of research excellence and robust methodologies. These reflect the priorities of Research Councils, one of their main sources of research grant funding. Time horizons are long as universities are in search of new knowledge and understanding, and the language used is that of the research fraternity. The rail industry priorities are on immediate delivery of safe and reliable train services, necessitating short-term time horizons, and their language is of profit, cost, trains, operations and infrastructure. Thus the Translator Organisations are essential to enable rail research to be transferred into practice as they understand both research and rail industry terminology, and have the market and research understanding to be able to unite these elements, and deliver successful innovation. The Vampire software is an example of one such successful innovation and illustrates the role Translator Organisations play. It required the translation and integration of fundamental research into both the movement of physical masses and the flexing of structures in response to stimuli into a product for rail vehicle dynamics modelling that assists designers optimise vehicle characteristics such as ride quality. The above discussion and figure illustrate the principles at work in the rail industry enabling rail research to be successfully transferred into practice. Of course, universities do undertake consultancy and applied rail research and so work with industry directly. Translator Organisations manufacture their own products and so also undertake application engineering. The cost of rail research and development increases as fundamental knowledge is developed into applicable products and services. Fundamental rail research involves theoretical studies, laboratory experiments and testing, mostly at reduced scale to minimise costs. The translation of ideas into prototype rail industry relevant products, methodologies and services often require full scale testing, field trials or in-service use potentially requiring safety approval for limited use. The translation may also require large scale surveys, large volumes of data or prolonged use. These all significantly increase costs over fundamental research. An indicative figure of 10 times has been shown in Figure 1 but in reality it could be much more. To take prototype products and apply them then requires application engineering; tailoring the products to the many different installations and configurations that exist on UK railway and underground systems. Application may also require safety approval for widespread use. Figure 1 shows a further ten times cost increase but again this is indicative and could be much more. Applying prototype services and methodologies also involves further cost increases but the cost increases are generally not as great. Risk is an inherent part of rail research and development. Success cannot be guaranteed. Assumptions must be made about anticipated market demand, the feasibility of making different technologies and methodologies work together, the ability to change processes and the appropriateness of the solution to the political, economic, social and technical climate that will prevail when the solution is implemented. The challenge is to ensure that risk is minimised at each stage. Prior to privatisation, the majority of railway engineering research was carried out using public funds by British Rail Research (BRR) and hence engineering research expertise was focussed in this organisation, although BRR did sponsor research in universities as well. The success of this arrangement can be demonstrated by the number of products now in use on the UK railways that originated from research conducted by BRR (see section 2.2.2). Privatisation (1994-96) created a rapid change in which BRR personnel were halved in number and subsequently became part of private companies. Through this change, the main part of BRR became AEA Technology Rail. AEA Technology Rail has significantly increased personnel numbers, however the ring fenced budget for rail research and development allocated by British Rail to BRR has no direct equivalent. This has meant that AEA Technology Rail has focused on consultancy and undertakes far less R&D than in BRR days. The university rail research capability is examined in a later section. In the commercial area, extensive research was also undertaken by British Rail, including the direct funding of University posts. These ceased at privatisation, and the level of strategic research on commercial issues greatly decreased. Following privatisation of British Rail, there was a period of consolidation until July 1999 when the Shadow Strategic Rail Authority was set up, now the Strategic Rail Authority (SRA). It was established by Government to provide a focus and strategic direction for Britain's railways, to encourage investment and manage the passenger rail franchises. Of particular relevance to this project is section 205 of the Transport Act 2000. This states the SRA's purposes and includes "to secure the development of the rail network" and this is assumed to include rail research. Growing safety concerns following accidents including Southall (1997) and Ladbroke Grove (1999) lead to an DETR review that called for Railtrack's safety and standard's organisation to be set up as a separate body. Thus Railway Safety was established in December 2000 with a rail research and development budget of £70 million over the next five years. Further changes to the structure of transport in the UK are ahead with the forthcoming Public Private Partnership for London Underground. Reversing the effects of the maintenance backlog, while meeting the challenges of rising demand and the aspirations of the Lord Mayor of London will pose many further challenges, operational, commercial and engineering alike. There is also renewed interest in light rail transport to address inner-city road congestion and pollution. These, together with the Integrated Transport Policy are significant and positive recent developments in UK rail transport.